Two months ago, Bing and Yelp announced a local content partnership that looks like a win-win for both parties. For Yelp, the deal offers increased exposure and is part of what’s been a pretty great year when you factor in its growing visibility in Apple’s iOS, too. For Bing, which stopped accepting user reviews last year, the deal means more content on its local business listings. Over the past few weeks, I’ve had conversations with officials at both Bing and Yelp to learn more about how the content partnership works. Here are six things that small business owners and local search marketers should know about their agreement. 1.) Bing is able to display three types of Bing content: review snippets, business attributes and photos. Although Bing has access to full business data (more on that in a moment), the agreement currently allows Bing to display the three types of content listed above in its local business listing pages. This Bing listing offers a good example of all three. 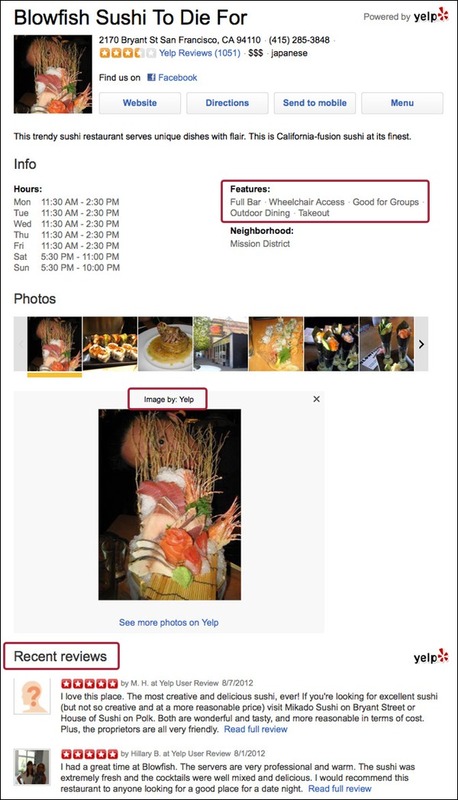 Business attributes show up on Bing as “Features,” while Yelp photos are mixed in below that with any other images that Bing has for the business and, finally, Yelp’s review snippets are below the photos. 2.) Bing is only using Yelp content in six local business categories. 3.) A minority of Bing business listings are being enhanced with Yelp content. Bing says that about 30 percent of its listings have Yelp content at the moment. 4.) Bing gets basic business data (NAP) from Yelp, but display data still comes from other sources. Bing says it looks at Yelp’s business data (name, address, phone) only for matching purposes — to make sure that the right reviews are being shown for the right business. The business data that Bing shows in its local listings still comes from the Bing Business Portal, InfoUSA, regular web crawls, etc. 5.) A Yelp listing can get a business added to Bing Local. Even though Bing isn’t using Yelp’s basic business data for display, in cases where Yelp has information about a business that’s missing from Bing’s database, Bing says it will “generally” add that business to improve its own local search coverage. 6.) Data updates can take a couple days to show up. The Yelp content/data is refreshed on a daily basis, but Bing says it may take a few days for new content (from Yelp) to appear in its local business listings. There’s obviously also a financial aspect to the Bing-Yelp partnership, but (not surprisingly) neither company was willing to share any details about that. The bottom line for small business owners and local search marketers? Having good Yelp content can help to supplement a Bing business listing, but it doesn’t necessarily replace the need to use the Bing Business Portal or InfoUSA to get started with Bing. Thanks for sharing these insights, Matt. This is definitely one of the most exciting “partnerships” in the space right now. I’m mostly interested in the way Bing syncs business data coming from Yelp with the one they have from other sources. Bing Local is definitely not as duplicate listings nightmare as Google Local, but yet again – their overall businesses database is significantly smaller (supposedly). 30% of Bing’s listing having Yelp content associated with them is definitely a good percentage having in mind Bing is using Yelp’s data only for some categories businesses. You’re welcome, Nyagoslav — good point on the size of Bing’s database. I’d love to know how it compares to others. I am totally agree with your final thoughts it is not necessary that the combination of these two companies will definitely increase the usage of Bing. I don’t why but Microsoft has really not performed well with Bing. Well apart of this Yelp is obviously the big shark of the business listing websites but still it is the good opportunity for them to increase the usage of their data.But I am not sure how beneficial is this partnership is for Bing.